Last october, the CIRM (which has a gorgeous location in the Calanques) has launched its very nice Audiovisual Mathematics Library, featuring HD videos (many being multi-angle, or post-edited — it does lag quite a bit on my connection, but maybe it’s better with a big university broadband network). So I’ve now added that to my previous list. The Hadwiger-Nelson problem is notoriously difficult. (For context see e.g. this text by Michael Payne.) In fact, it seems that the (weaker?) problem to find a 5-chromatic unit distance graph in the plane is still open (see the interesting 2009 Mathematical Coloring Book by Soifer, I couldn’t find more recent improvements online). So the idea would be to build on top of that. A first step would be to find a 4-chromatic unit distance graph that has necessarily at least two vertices of the 4th color. And then build further on that one. So I’ve done some trial and error, and found something that is agonisingly close, namely the following graph on 16 vertices has the correct topology (i.e. a Sage computation gives its minimal set of colored vertices as [[13, 6, 8, 1], [11, 10, 15, 5, 2], [4, 3, 14, 12, 9], [7, 0]], so indeed two vertices of the 4th color), but unfortunately it doesn’t quite have distances 1 everywhere. (and same problem with vertex #15). Edit: Some further tinkering didn’t get anywhere. 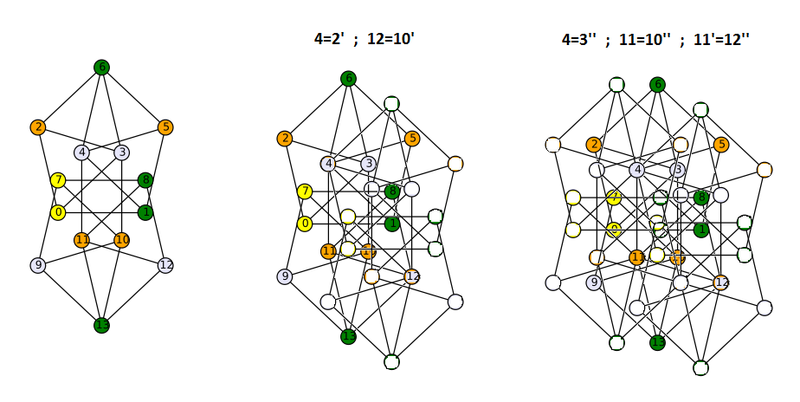 Removing for simplicity vertices #14 and #15 we do get a 4-chromatic unit distance graph such that at least two vertices have the 4th color. But I then tried to pack several copies together to increase that number, in the hope that eventually some 5th color must be needed, but it is highly nontrivial: gluing two copies (i.e. 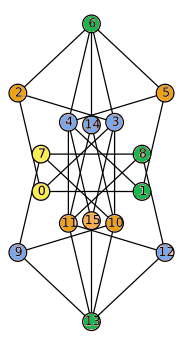 some graph that contains 4 spindles) does produce four vertices of the 4th color, but gluing a third that has at least one common vertex with both first copies does not necessarily lead to strictly more than 6 vertices of the 4th color, in my example I still get 6 with the partition [[36, 31, 25, 19, 13, 6, 33, 27, 21, 15, 8, 1], [35, 17, 12, 10, 4, 34, 30, 24, 2], [29, 23, 11, 3, 28, 22, 18, 16, 9, 5], [32, 26, 20, 14, 7, 0]].